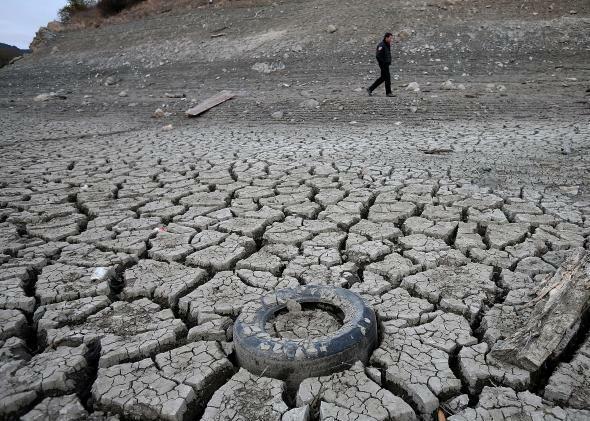 California's drought is now even more horrible. A security guard walks the perimeter of the Almaden Reservoir on Jan. 28, 2014, in San Jose, California. One year later, the California drought has only gotten worse. California’s epic drought is about to set another seemingly unbreakable record. With just two days remaining in the month, no rain in the forecast, and a monster ridge of high pressure camped out overhead, San Francisco is now all but assured of its driest January in city history—exactly zero (that’s right, 0.00) inches have fallen so far. If the dearth of raindrops holds out, it will beat the record set last year, when just 0.01 inches fell at the airport. The long-term average rainfall in San Francisco in January is about 4.5 inches, with records dating continuously back to 1850. In the past, the city has received up to 14.5 inches in January (in 1916). Image: Screen capture of National Weather Service climate data. And it’s not just San Francisco. In most of northern and central California—the hardest hit regions of the state’s drought—rainfall in 2015 has been less than 2 percent of normal. Any hopes the state had of finally turning the corner on its oppressive, possibly climate change–fueled megadrought have withered like the Sacramento River. Progress made in refilling the state’s largest reservoirs thanks to a series of major December storms has stalled, and key rainfall indices are back to being below normal. Snowpack in the Sierras, which supplies more than 60 percent of the state’s water resources, is down to a dismal 25 percent of normal. New data released by the National Drought Mitigation Center on Thursday showed 40 percent of the state is now classified as “exceptional drought,” the most severe category. California was off-the-charts hot in 2014, shattering the previous statewide heat record by nearly 2 degrees Fahrenheit. That may not sound like a lot, but until last year, the entire historical range for all years dating back to 1895 was only a bit over 4 degrees Fahrenheit. The distance separating the now second- and third-warmest years (1934 and 1996) is just one-tenth of 1 degree. 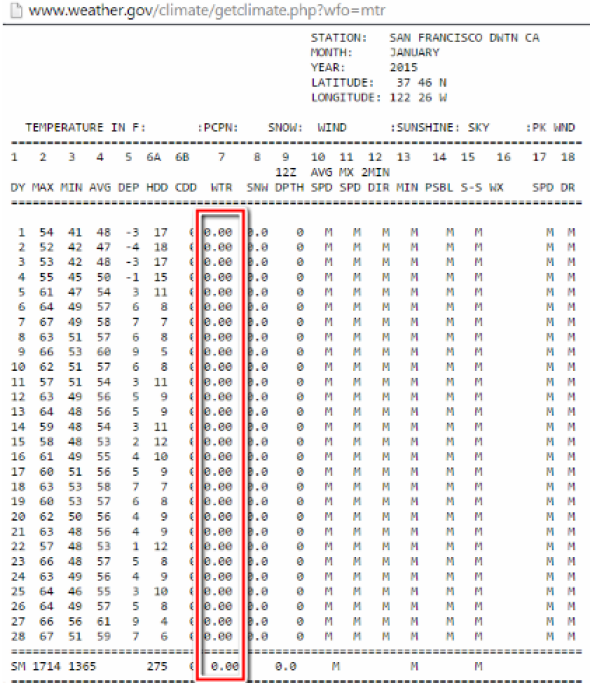 The temperature so far in 2015 has been much above normal, as well. As the drought plods along, the impact on sensitive industries like agriculture has continued to worsen. This winter, the California salmon industry was decimated by warmer-than-normal water in the state’s lakes and streams, reports Capital Public Radio in Sacramento. Meanwhile, the Sacramento Bee reports that the state is considering temporary dams on the vulnerable Sacramento–San Joaquin Delta in a desperate attempt to keep saltwater from encroaching inland into sensitive wetlands and the state’s drinking water supply. The delta sends water to about 25 million urban Californians and helps irrigate a vast section of the state’s agricultural production. For now, California is the country’s leading dairy-producing state. That might change if the drought continues at this pace. Iowa Public Radio reports that there’s been an increasing exodus of dairy farmers from California to the Midwest, where supplies of grass and grain are more stable. With the specter of climate change, these kinds of stories hint at what could be a broader decline in the country’s leading agricultural state in coming years. As for the current drought, there’s increasing evidence that last month’s boost in rains could have been a fluke. In the weeks ahead, the whole of America is about to get a blast from the ghost of weather past. It’s as if Marty McFly transported the entire country back to this time last year. Same weather pattern, same result: bitter cold in the East, a baking-hot and dry West. The primary culprit, as it was last year, is a stubborn ridge of high pressure camped out over the Pacific coast, shunting moisture northward away from California, and opening the atmospheric gates for wave after wave of frigid Arctic air to spill southward toward the East Coast. 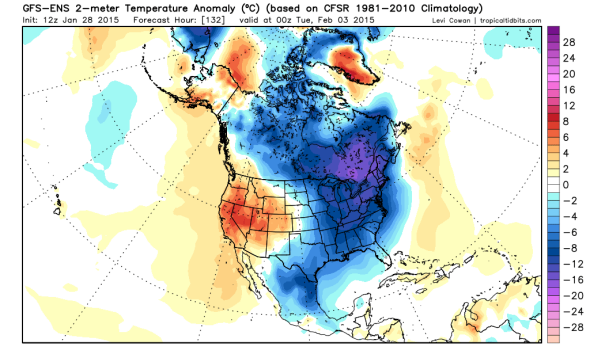 Tuesday’s forecast temperature anomalies across North America. Look familiar? Meanwhile, the latest runs of the GFS model—the one that nailed Tuesday’s nonblizzard in New York City—shows no fewer than six snowstorm chances for the East Coast before Valentine’s Day. Snow-starved Washington, D.C. could see a major storm on Monday, the day after the Super Bowl. The most recent update from the Washington Post’s Capital Weather Gang gives hope to snow-lovers: “Most of our snowstorms this winter so far have just been field goals, this one could be a touchdown.” Anywhere from 2 to 10 inches could fall on the nation’s capital as a suddenly-very-active winter weather pattern continues in full swing for the East.